The CEOS Data Policy Portal: A compilation of key information about and links to satellite data policies, data access portals, and interoperability protocols. 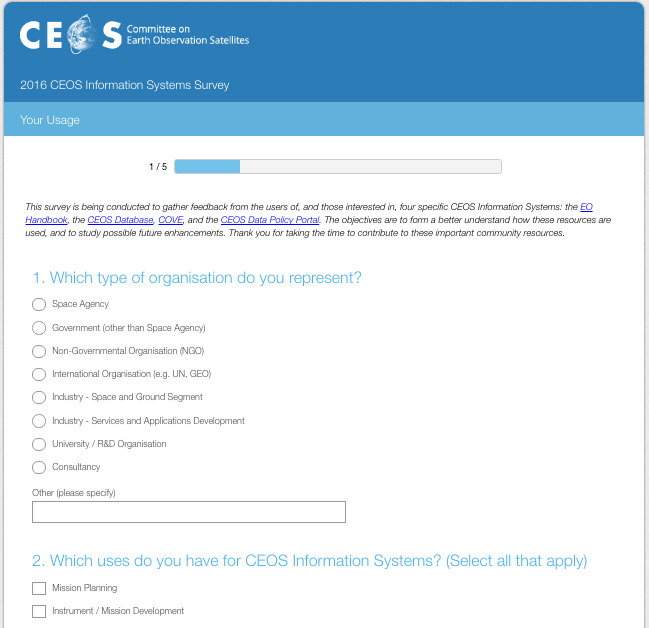 As part of ongoing efforts to improve these resources, we’ve put together the 2016 CEOS Information Systems Survey to gather user feedback on these resources and suggestions for improving them. This survey is intended for anyone with an interest in or any experience using these CEOS resources, whether you are actively involved within CEOS and our activities or merely part of the broader Earth observation community (or the general public). We greatly appreciate your willingness to take just a few minutes to complete our survey. We will present a summary of initial survey results at the upcoming 2016 SIT Technical Workshop in September, followed by a final summary of results before the end of 2016. These findings will help guide our future design and feature enhancement decisions for these services and tools. Please also circulate the survey within your organisation, as appropriate. The survey will remain open until the end of September. Please contact our survey coordinator, George Dyke, with any questions or concerns.